“My my what’s with that face? Welcome to Fitzsimons Incorporated. We had time freed up, so we had lunch early which is good news for your team. However, don’t use try using intimidation techniques on us like the company delegation attempted in the recent meeting and ended up helping us with our Power Lunches.” Elizabeth Fitzsimons spoke as the door opened to the quickly shocked team of lawyers and company person from a rival company. 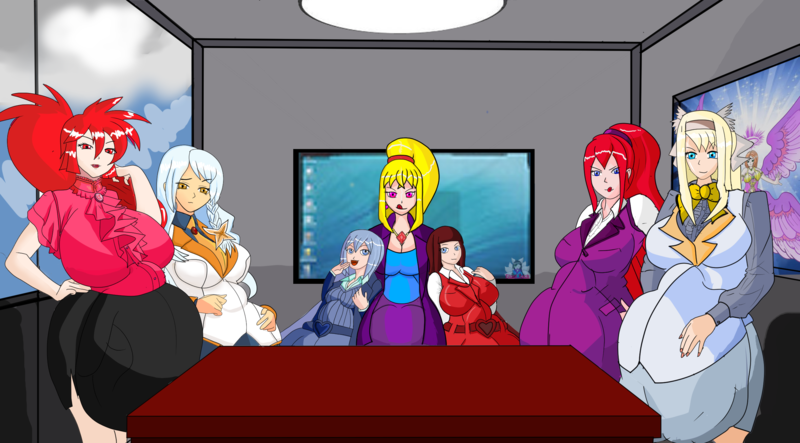 Little did the rival company know that most of the ladies on the desk weren’t that good for debating and the only reason that they are in on the meeting was for the free food that Liz cheekily promised them. After being dressed up in some of Liz’s clothing range they did get their food and looked for seconds if the next group decided to incur Liz’s ire. This one took me ages, working on perspective shots and other things in this image, wanted to have a point of view image of someone walking into the room and seeing the last group’s fate. I think it works well with the ladies all enjoying their respective meals. No internals on this one, happy to have completed it and thanks to those who helped me along the way and let me pinch their OCs as well. Hehe, looks like a great room to be in. Wouldn't mind meeting Liz and company, as long as I don't become lunch. I'd try my best to avoid saying anything derogatory, sexist, or just plain stupid. This is floof tech support, how may I help you?.. No I can't fix someone having thrown a chair through your TV out of rage... Nor is it possible to fix liquid damage caused by stomach fluids. Page generated in 13.092 miliseconds. 17 Queries.